Region: Eastern Shore of Maryland, along the Pocomoke River. 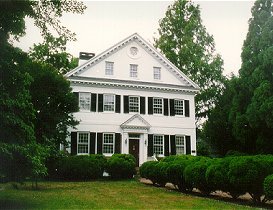 Chanceford Hall is a beautiful Bed & Breakfast, c. 1759 manor house. This National Historic Landmark with over 6,000 square feet of finished space, is centrally heated & air conditioned. There are ten fireplaces & a lap pool. Situated in the picturesque town of Snow Hill, along the Pocomoke River (perfect of canoeing), Chanceford Hall Bed and Breakfast stands majestically in its own park. 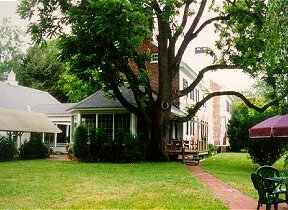 A Maryland Champion tree, the third oldest black walnut tree in the state; weeping cherry trees, magnolias, boxwood & holly create a lush backdrop to historic Chanceford Hall. Each bedroom has a private, modem bath. A 1st floor bedroom is available & two bedrooms on the 2nd floor can be opened to provide a two-bedroom suite. Each bedroom is large & filled with antiques including a four poster, queen size bed. A gourmet breakfast is served. Upon arrival, refreshments are served to help you relax into the world of Chanceford Hall Bed and Breakfast Inn. This and other Eastern Shore Bed and Breakfast Inns can be found here in The Register.